The Carden-Loyd Carrier was later built by Vickers-Armstrong who took over the company in 1928. The first carriers date from 1927. It is a very small light weight all terrain tracked lightly armoured vehicle. It was operated by a crew of two: driver and machine gun operator. Originally it was opened topped but in the Swedish version Mark VI Carden Loyd carrier armoured hoods were added to go over the crew's head. 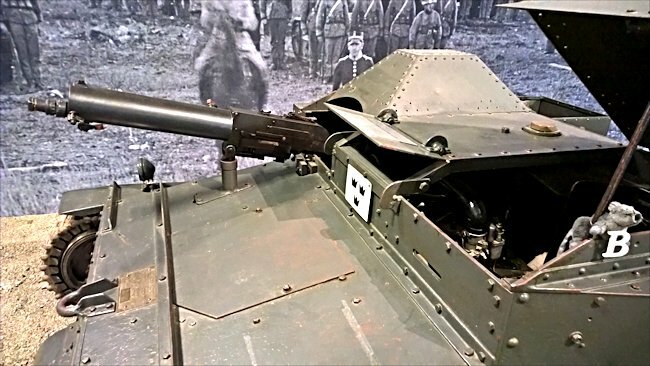 It was not really meant as a tank but more of a machine gun carrier to give support to the infantry, but most WW1 tanks and a few WW2 tanks were only ever armed with machine guns so for its time it could be considered as good as some tanks. The main difference being that it did not have an armoured turret. The Mk IV was powered by a model A Ford petrol engine that produced 28hp, driving the forward track sprockets though a two speed gearbox. The engine was situated between the two crew members which was okay on cold winter days but very uncomfortable during a hot summer. The Mark V* carrier was powered by a Ford Model T engine. The machine gun was mounted on a swivel stand that gave a limited traverse so the gunner had to rely on the driver pointing the tankette in the general direction of the enemy. The great thing about this type of tracked vehicle is that they could be produced in great numbers because they were comparatively cheap when compared to the cost of making a tank. This is why a number of European countries were interested in purchasing them from Vickers-Armstrong. The British Army purchased a lot of Carden Loyd Carriers and used them in the roll of light tanks for reconnaissance. They were manned by personal from the Royal Tank Corps although they had originally been meant to be crewed by infantry personnel. It did have suspension but it was very crude. There were small leaf springs kept in place by a main girder that supported the tank track wheels. These tankettes weren't meant to go very fast. They were designed to keep up with the infantry. The Swedish Army representatives observed the British Army's deployment of these small machine gun armed cheap vehicles. The lack of finance was always a problem for the Army. At first the Carden-Loyd tankette seemed to be an economical replacement to the large and expensive WW1 German built Strv m/21 tanks. 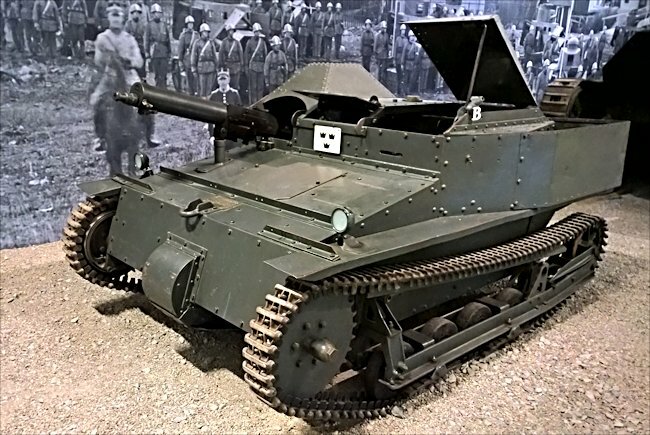 In the early 1930's Sweden purchased two different versions of these British built tankettes for trials. There were worries that the low profile, although good for concealment, would be a problem when fighting battles in Swedish terrain. The army wanted to see whether it could deploy the machine gun and fire at targets at such a low distance from the ground. In the Scandinavian forests there are a lot of obstructions like fallen trees, glacial boulders and hillocks that could get in the way. The machine gun in the Strv m/21 tanks was high up in the turret so could easily shoot over any obstacles. The trials of the two Carden-Loyd tankettes did not pass all the tests they were put through and there for rejected as the next choice to replace the aging Strv m/21 tanks. They used them to tow the new Swedish Bofors 37 mm infantry gun m/38 up until April 1935 when they were transferred to the P2 tank battalion. They were then given the name 'light tank m/Carden-Loyd' and came to be used in a reconnaissance role mainly on roads. The Army found that they could pull a trailer across open country. Some of these trailers were filled with ammunition. Another was adapted to enable infantry troops to be transported into battle. Despite the fact that the vehicle was manufactured in England the driver's position was on the left of the vehicle which was ideal for use in Mainland Europe. 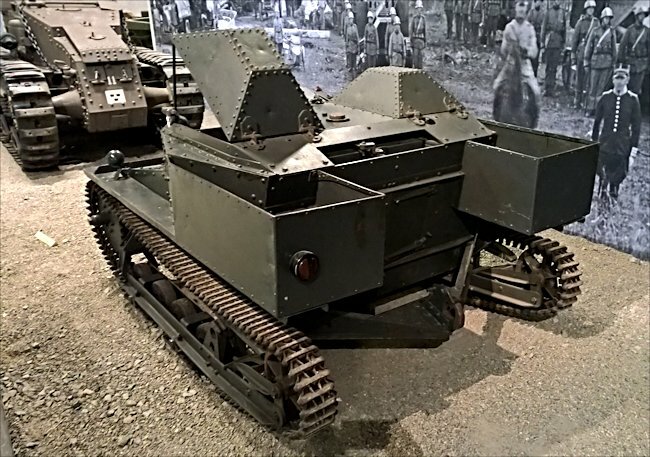 What are the differences between the Carden-Loyd MkV* and the MkVI tankette? Both vehicles weighed 1.4 ton and had a two man crew. They had an identical top road speed of 45km/h even though they had different engines. The MkV* was powered by a Ford Model T petrol engine that produced 22.5hp. The MkVI was fitted with a Ford Model A petrol engine that produced 28hp. They were both armed with the identical 6.5mm m/14-29 machine gun. The Mark VI crew were protected by armoured hoods.